As I begin my first article – my debut attempt at anything like this – I admit it’s on a topic that will likely divide opinion, but more importantly, start a conversation. Norwich City fans, in general, feel a sense of entitlement much like other clubs who have recently been relegated from the Premier League; an inescapable feeling that we deserve to play in the top league, despite our current league position. However, unlike clubs such as Sunderland or Aston Villa, we have little reason to feel this misguided sense of entitlement to the promised land that is the Premier League. Since the formation of the division in 1992, City have spent 16 seasons out of 24 outside of the Premier League, with it now looking increasingly likely that we will be set for a 17th. In comparison, Swansea, Middlesbrough and Leicester have spent 13, 17 and 13 seasons respectively outside the top league, with the Foxes even boasting a fairy-tale title win in 2015/16 – a season that saw Norwich relegated from the league for the second time in three seasons. In past years, you might have been able to fairly compare Norwich to these teams, and suggest we are of similar stature, however, it is clear that City are not on that same level anymore. Prior to their struggles this season, Swansea had cemented themselves in a mid-table position in the Premier League for the last 7 years. Despite being in the same league as Boro, we evidently lack the financial backing they have proven to have this past year, and Leicester, well, since their against-the-odds Premier League winning season and subsequent run in the Champions League – along with foreign investment leading to record-breaking signings – it is impossible to claim City are even close to their level now. The issue here, for me, is too many of our fans believe we deserve more than we actually do. In Stuart Webber’s recent interview on the club’s official YouTube channel, he explains how the biggest surprise since joining the club, was the ”expectation on the club” from the fans, with regard to our financial position and league position. We are a mid-table championship side, with fans who expect us to be in the top three, spending £10m+ on a striker. We simply cannot think like that anymore. If this season has shown us anything, it’s that you don’t have to spend millions on a player for them to possess the quality we need. Take Tom Trybull and Christoph Zimmermann for example, who both signed for City on frees from foreign lower leagues. They didn’t set the club back significantly in a financial sense, the only risk being giving them the game time to show their ability, which has clearly paid off. These low risk, high reward signings are exactly how the club needs to act now and in the future. Our current scouting network, aided by Farke and co’s German league knowledge, along with our youth setup, is vital to our philosophy and is what must be utilised if we are to progress as a club. We can easily sign ten of these players for fees ranging from zero, to a couple of million, and if just two or three work out, it is still much better than splashing tens of millions of pounds on ‘quality’ or ‘well known’ players at this level. Expensive signings also have an increased chance of failing to live up to their billing, or simply bring too much ego and entitlement into the squad, which is something we cannot risk right now. This is important, because one vital ingredient to Farke’s ideology, is having a team of players that actually want to play for Norwich City Football Club. If you watched Timm Klose’s 95th-minute equaliser against Ipswich live, or even on TV or highlights, then you will get what I mean. We now have a squad of players willing to give it their all for the badge and for the fans – and this has been achieved by lowering the average age of the squad, and bringing in players who are hungry for game time, ready to give everything they have in order to show why they deserve their chance. One shining example of this was the determination shown by Zimmermann in our 2-2 away comeback against league leaders Wolves. As this shows, he made a mistake but was intent on making up for that mistake, as far as to literally put his body on the line to prevent the Wolves attacker from being able to shoot. This is what it means to him to play for Norwich, as he has taken his chance and proved to us why he deserves to wear the shirt – and we owe him for saving us many times this season, with last-ditch tackles and immense headers, not to mention how he adapted to the league after struggling a little initially. These transfers are what we need if we are to commit to the ‘Webberlution’, despite the fans who want to see us sign players for big money. Our fans’ attitude to the club and its stature could be justified if our recent spells in the Premier League were backed up by a glorious history. However, our honours list is small, as our rivals down in Suffolk never fail to remind us of frequently. In 1962, we won the League Cup, a trophy we won again in 1985 – which actually marks the last time we won a notable trophy. Since then, we have ‘won’ promotion as Champions on three occasions, from Division 2 in 1986, Divison 1 in 2004 and League 1 in 2010, not to mention promotion as ‘runners up’ or through the playoffs on several occasions. One ‘honour’ which the Ipswich fans love to point out to us, is the fact we have previously referenced ourselves as ‘participants’ in the 1993–94 UEFA Cup. Even though our run in Europe will always go down as one of the greatest times to be a Norwich City fan (despite not being alive myself to experience it), it is a little embarrassing to see it used as something to cling to as an ‘honour’. History isn’t everything, but to be a big club you must have something to be able to back it up with. We aren’t fueled by middle eastern billionaires, we haven’t won anything in the last 30 years, and our recent Premier League history only shows what could have been if the club was looked after properly, as it is under Webber now. In simple terms, we cannot continue to expect unrealistic things from our club. Recently a lot more of our fans have come to terms with our position, but I still see so much unnecessary negativity, and unfeasible expectation based from our past. An example of this would be the expectation for us to beat Ipswich last week. This isn’t going to be easy reading, but on player-for-player terms, we are not much better than them. Currently we are both mid-table championship sides, the only real difference being that we have more ambition, and more potential for the future than them, as shown by their joke of a manager, puppet-like CEO, invisible owner and total lack of transparency to the fans, which almost (but not really) makes me feel sorry for them. This shambolic management of their club has not gone unnoticed by the fans, as you can see by their dwindling attendances. Clearly we are always going to feel our players are better, but if that was the case, shouldn’t we be more than a single point above them in the league, and not having to rescue a draw in the 95th minute? But that’s not all. Fans seemed to expect promotion this season. While at times not being far off the standard, we have fallen short and by some distance. We are in transition, and wouldn’t even be ready for the Premier League if we were to win promotion this season, so for me, the important thing is not just promotion, but doing it right and being ready for what comes after instead of ‘yo-yo’ing’ back and forth. The players get it. They understand what should be expected of them, but give so much more than we deserve. As fans, we must do the same. This isn’t a piece aiming to have a go at our fans – I love this club and its fans, but as loyal supporters we must all come together to share that love for the club and its players; in moments like the march before Ipswich at home, and the atmosphere during the game, which emphasise exactly how we need to be. We celebrate our wins (and draws – despite what Luke Chambers feels) together, but it is important we learn from defeat together too. Webber and Farke are building something special at our club. 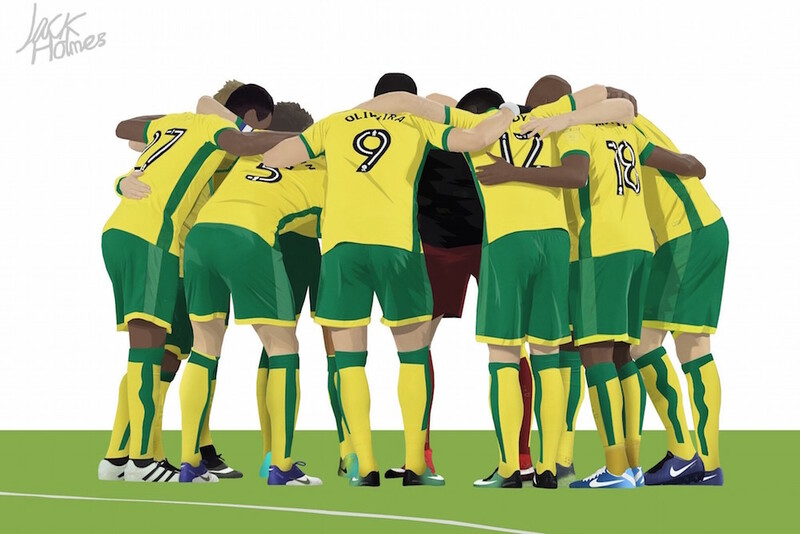 It will take time, but it will be worth it, and the future will be a great time to be a Norwich City fan – as long as you stick around to see it. Cheers to Jack for sending us that thought-provoking piece and also for allowing us to use a couple of his excellent images. Interesting topic and well argued. I think the success we had under Lambert (back to back promotions) and then spending 4 out of 5 years in the Prem has raised expectations to a potentially unsustainable level. Over the last 10 years more teams that were relegated from the PL have gone on to a successive relegation than promotion within 3 years which is an indication that maybe we should be happier with out lot in life. A well constructed and valuable contribution to the Norwich City debate which makes some good points. My worry about the future of the club is that we need to be challenging for the Premier league now because the longer you are out of it the harder it is to get back. Let’s say we were to get promoted this season, yes of course we would be unprepared and may be immediately relegated again but the financial impact on the Club would be very beneficial. If that aim is not being put forward by the management of the club how can we expect the players to respond? I therefore understand those people calling for an end to the Farke reign even if I disagree with them. The improvement in our defense is there for all to see but goals win points and that is where we are failing. Those who look at Farke’s previous experience as a coach will point to the lack of goals his team produced and put two and two together. So I am with you to give the experiment time but I want to see signs that the lack of goal threat is being addressed. Of the last 4 games played we certainly should have won 3 and those six points dropped would have us two points from the playoff positions. It is a game of small margins. How do you know the club “is being looked after ” by Webber. Surely our history is lettered with CEOs, Managers, and Board members who were “looking after the club”, only for time to show that this often wasn’t the case. The truth is we’ve had a number of chances to progress far further than we actually have done, but a combination of poor managers, poor CEOs, and an incompetent Board have conspired against us. If you really look at both the big picture and look long term, our future looks anything but bright. I think it’s 60% of Championship clubs that have significant financial backing, and relegated clubs from the Premier have a minimum of £100 million to bring to the Championship. This has to mean that, as the seasons roll on, Championship clubs will have more and more money to spend. Whilst a club like Norwich do indeed need to buy cheap but well, and have an effective youth policy, that in no way will make up for our lack of cash. Given that Delia does not have the money needed to a) get us back to the Premier, and b) to establish us in the Premier, our longer term future inevitably be in the Championship, where we will slowly become less and less of a force to be reckoned with. What makes this even worse is that Delia will not sell to allow for finance to come into the club. What it even worse is that she will pass on her majority shareholding to Tom Smith. What is even worse is that, even if he wanted to, Tom Smith will not be allowed to sell, in order to finance the club effectively (owing to the nature of his shareholding in Trust). Just two final points to be made; 1) It is true that big financial backers will not guarantee success (just look down the A140). With effective due diligence this risk can be managed. We can also be certain that, without financial backing we can probably guarantee a lack of success. 2) If I don’t like it then go and support Ipswich is often a comment in response to these types of views. Having followed City since 1959 and been a season ticket holder for much of that time, I have City best interests at heart, always have and always will. Excellent debut Jack. But expect plenty of brickbats from the usual suspects! Compared with some of the regular authors on here, you show a level of insight and ability to communicate that is fantastic. Hope to hear more from you. I don’t think Jack should expect or receive many brickbats for a well-constructed and well-balanced article like that! Great debut Jack and I thoroughly enjoyed reading it. I won’t pick over all the bones but when “one considers” the money wasted on Messrs Naismith, Wildschut and Jarvis it is infuriating and I think the Webber-Farker way forward is the correct approach for the future, regardless of our resources – which will forever be limited because of the Smiths.. THESE players do get it, as you say. I am not sad to have seen the back of one or two of the old guard tbh. A couple more to shed yet and here’s hoping in the summer. I also doubt Ipswich would refuse to swap like-for-like with us although I am not really that fixated with them, as much as I would like to see us finish above them. Money wasted on Wildshit, sure, but we all wanted Naismith at any price and Jarvis showed great promise before he was injured. So you can’t really call those two a waste when the intention and what we thought we were getting just didn’t turn out for whatever reason. Summat just didn’t click for Naismith, and it certainly wasn’t for lack of effort. The bigger wastes we’re giving Hughton all that money to spend on attacking talent when he had no clue what to do with it. We are where we are now because of then. Is Mick McCarthy really a “joke of a manager”? Ok, he has probably outlived his welcome down the road, but he is a more effective manager in the Championship than some we have employed here in recent years. And I believe him when he says he could have used our Premier League and parachute transfer budget much more effectively than the way it has been largely squandered here. How can you honestly say he’s better than some managers we’ve employed recently when every one of them has finished above Ipswich for his entire tenure? Exactly. And McCarthy’s style of football is just horrible. I think I can see steam coming from Jeff’s ears from here! I am caught in several thoughts about this. I can see (and we have proof) that there are bargain defenders and midfielders who can be improved by good coaching and a suitable playing style. I think there is far less likelihood of finding a bargain goal scorer who can operate at Championship level and above (I hope Sir Benny proves me wrong!). I think it would be a struggle to find anyone who could be anywhere near prolific for less than £10m-perhaps Grant Holt was the last one ever. I was talking to my West Brom supporting mate yesterday. We agreed that middle sized clubs like ours will never be able to cement a long term place in the Prem. The top 7 or 8 sides have to spend £150m per season to stand still and I doubt there is anyone who will bank roll us to that extent. I don’t mind us being a yo-yo team as the euphoria of promotion outweighs the disappointment of relegation. There has never been a time in my 40+ years of supporting Norwich when I thought that we will be in the same division forever-that’s still the case. Jack says that little 1p5wich have an invisible owner who lacks transparency; surely this isn’t possible. I wouldn’t claim Mick McCarthy as a joke of a manager, as you say, player for player Ipswich are alongside us in the position they are – except without the money we’ve had. McCarthy clearly cares and has done wonders on the shoe string at Ipswich. I think it’s testament to his management skills he’s kept that club in this league. Better the devil they know and whilst the football is hardly pretty McCarthy’s shrewd observation when it comes to set up a team to frustrate and nick a win or three has paid dividends. They’re Championship bound for another season at least, the anxiety of the derby remains! As for McCarthy, in spite of his Yorkshire ” charm” he knows his job and a description of him as a “joke manager” is just plain wrong. The fans are paying Prime Rib prices but are served Big Macs and the Sporting Director is confused by expectation Talk about disconnect. The club was down on its knees and McNally said “we’re going to be a PL team”. And we were. Webber inherits a team with a parachute payment and 30-40M worth of players on the books, sets no targets, then declares “We’re happy we’ve got breathing room from relegation”. Ambition and vision go a long way. With respect, Dave, that’s a shocking distortion of Stuart Webber’s inheritance and aims. He inherited a mess. A squad about to finish mid-table, but with a top-of-the-range wage bill which took up every penny of our income, including the parachute payment that was about to fall off a cliff. Worse, many of the high earners weren’t contributing to the team and would be difficult or impossible to move on, even without asking a fee. His immediate challenge was to carve chunks out of the wage bill, while simultaneously bringing in new players that his Head Coach could mould and developing existing assets (including a certain James Maddison who’d never started a game) into potential sources of future income. If you read any of his interviews – including the one in Saturday’s match programme – Webber is as explicit as McNally was about the aim to be in the Premier League. Given our circumstances, he talks about a programme of 2-3 years to do it. Ambition and vision do go a long way, together with realistic plans for the world we live in. In that regard, McNally and Webber are strikingly similar. Stuart, I don’t disagree that the club has problems, I think I’ve documented them well in the past, specifically stating we will need to sell Pritchard and Maddison (although you disagreed). But Webber’s issues don’t come close to touching McNally’s. Webber took over a team that finished shy of the playoffs, who had a caretaker that was turning things around, and the team had won four of their last six games (including putting 7 past Reading). His wage bill was, and is, high, but he had a number of people who were going to be out of contract, no effort for him there. He also had no external debt. While he did inherit some high earners, he also inherited Pritchard, Howson, Jerome, Maddison, Murphy x2, and Dorrans, the combined sales (past and future) of which will easily ensure he doesn’t face debt until 2019/2020. If needed he could probably sell Klose and Oliviera (two more inherited assets) to cover some holes. Of course, personally I’d rather we had owners that allowed us to avoid asset stripping the club, and once our assets are sold I don’t think we have a plan, but the truth is that he can use inherited assets to cushion him until 2.5 years into the job. In comparison McNally had almost no salable assets, a relegated team, no parachute payments, and huge debts. McNally and co. came with a ‘can do’ attitude. And they did. Dave, you really beggar belief. Last year you ridiculed, rightly, the idea that the players out of contract in the summer could make anything like the necessary impact on the wage bill. Now suddenly it meant “no effort” for Webber. McNally and Lambert certainly turned round a shambolic situation. But they found themselves with a strong core squad in a weak league, and no requirement to cut the wage bill. A very different situation from the one that faced (and faces) Webber. A couple of questions that you may choose to answer or not. Did you want Alan Irvine given the manager’s job? And did you actually read Webber’s interview last week, published in Saturday’s match programme, including where he sees us in two years (“If we’re not in the Premier League, we’ll be in a position where we can realistically get there”)? My name’s Stewart, by the way. Let me start with this..
etc…. Feel free to nitpick those numbers. Although, I still don’t know how you can claim we only need to sell Maddison or Pritchard, then say things are as bad as when we were near bankruptcy. Where’s the consistency? The point is simple. McNally had no money, no players to sell, no parachute payments, and huge debts. If you are trying to compare that with Webber’s situation then I can’t help you. As for reading the program. As you may remember I, like many others, are unable to attend games in person. Therefore, no I didn’t read Webber’s statement on our goals. If you’d like to scan and post it, I’ll take a read. Noting this came almost a year into his tenure, after a couple of interviews where he clearly knocked fans for expecting more from the club. As for Irvine, he would have been worth a punt. He certainly had us playing well considering just how poorly the club treated him. Dave: if you can’t be bothered to look at what Stuart Webber actually says – easily findable, for instance, on canaries.co.uk – it might be incumbent on you not to assert things like “he sets no targets”. Though of course I appreciate the reality doesn’t suit your narrative. Nice piece Jack, solid debut ?. Whilst I agree with the majority of what you say, I would add a small “but”. Whereas it’s totally counter-productive to expect promotion every season and squawk when it doesn’t happen, I also think there’s some value in the fans having a reasonably high expectation level. It sets a bar for what we expect of the team. It’s something all the biggest teams have and it gives you that benchmark as to how the club is doing. If an Arsenal or a Manchester United slips regularly to 5th or 6th they let their team know this is not good enough. Similarly for Norwich they expect to be somewhere between the lower half of the Premier League and the play-off spots in the Championship and when they aren’t the natives get restless. I think most sensible supporters accept that Farke and the Webberlution is such a sea-change for the club that they get a free-pass this season, and are taking the positives as they come. However, if there isn’t any progress next season then the project comes under greater scrutiny. And so it should. I’m pro Webber, pro Farke, and I’m staying positive but I also think the expectation level isn’t always a bad thing. As with most things, it’s those that take it to extremes that make it a problem. Great comment. I don’t believe that every year we’ll be in the PL, but when we’re not our goal should at least be the playoffs. If our goal isn’t the playoffs then we’re in a sorry state of affairs. Agreed, we should be aiming to be, consistently, one of the best 24 teams in England every year. If we’d been in the Championship when Paul Lambert took over, rather than having gone down to League 1, I don’t believe he’d have targeted immediate promotion. He’d have said – quite reasonably – he needed a season to get things straight and bed in his chosen players. Not to take anything away from him, but he didn’t have to cut the playing budget and found himself facing a weak League 1 with players like Grant Holt, Wes Hoolahan and Chris Martin. Excellent debut, Jack! For exactly the reasons you state, Webber and Farke appear to be combination that our circumstances call for. Swansea have had a good run. Let’s see a year from now how they stack up against us. Utterly heartbreaking to see our younger fans with such low expectations and who have a cultural cringe where ITFC are mentioned. Those of us who predicted a season of mid-table football were called negative at the start of the season but given the way we set about things it has not been a surprise. Most of us older fans know what we can be, the last 20 odd years have been a let down but we are still one of the top 20 supported clubs in the country, despite a total disregard of the fans and communication silence by the owners and a Board who are only interested in the opinions of a small clique of fans. Swansea, Middlesbrough and Leicester are superb examples of what could have been, add in Watford and Bournemouth to show that we have hope!!!! Actually, many of us older fans remember when Norwich were in the middle or lower reaches of the second tier and never expected to be higher. Our first time in the top flight was 1972 – a long time ago, but only the most recent third of the club’s history. It’s always good to strive and be ambitious. But the headline of Jack’s article, as well as the body, is spot on. I did warn you Jack! The problem to me is that football has changed out of all recognition, even since the Lambert years. To my mind your picture of reality stacks up much better than those who see it as lacking ambition. A perfect study in “little old Norwich” . Once again a lecture telling us what we “must” expect from our club, comparing us unfavourably with clubs half our size. The twenty years that preceded smith and co. Saw Norwich City a constant presence in the top flight, collecting FA cup semi finals, league cup finals and semi finals, European qualification (sadly taken from us by liverpools antics), third, fourth and fifth placed finishes. I and a great many others know what Norwich City can be and would be without the constrictions placed on it by an outdated family dynasty with no ambition and the small time attitude of a section of its own support. See my reply to Mike P.
An excellent article Jack, and one which I wish I could have written myself! I was also interested in the comments made – Some of them hopelessly negative, irrational and without supporting evidence. . However Nick makes a good point – Things have changed in football even since Lambert. The weight of expectation of all fans, not just Norwich is just too great. There are a lot of disillusioned fans out there.